Our neighborhood has been in the news a lot recently. Here's a collection of articles from the Globe discussing Fort Point. Many thanks to Linda for diligently staying on the lookout for them. Jimmy's Harborside Restaurant, a landmark on the South Boston Waterfront for decades, will be replaced by two mostly glass buildings with two large restaurants and a waterside public plaza. But it appears that Jimmy's, since 1955 a dining destination for business folks, pols, and tourists that was demolished earlier this year, won't return. Cresset Development, which recently signed a 75-year lease for the site, filed building plans with the state this week for 69,000 square feet of restaurant and office space at the Northern Avenue location and will separately submit plans to the Boston Redevelopment Authority today. The Globe created an interactive map of what our neighborhood and the surrounding area will look like ten years from now: Waterfront 2017. The man who helped reinvent New York's vibrant Soho and Florida's South Beach had a similar bold vision for Boston's Summer Street neighborhood. But that was a year ago. 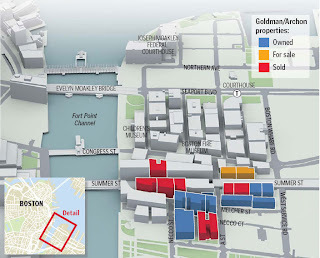 Since then, Tony Goldman and investment partner Archon Group have sold seven of the 17 properties that were to be the building blocks of a revitalized 24/7, live-work-play district in the Fort Point Channel area. And now they have put two more buildings on the market - 316 and 322 Summer St., historic warehouse structures whose renovations were to kick off the transformation of Summer and adjacent side streets. The city approved the prominent brick buildings for conversion into luxury condos, but the residential market has cooled significantly in the last year. "We found it very difficult to do that project in an economically feasible way," Goldman said in a telephone interview yesterday. "The construction costs being where they are and the market being where it is, it doesn't pencil out." Development on the long-stalled South Boston Waterfront got a kick-start yesterday, as Waterside Place, a 1.1-million-square-foot urban shopping plaza, hotel, and residential complex, won unanimous approval from the Boston Redevelopment Authority. Construction for the vast block of buildings, proposed for the land and air space between the World Trade Center and the Boston Convention & Exhibition Center, is scheduled to begin early next year. It would be the second major mixed-use project to get started on the waterfront, following an office building on Fan Pier set to break ground this fall. The Big Dig's Interstate 90 extension through the Seaport district is complete, and residential buildings and a new hotel nearby are finished. Fan Pier developer Joseph F. Fallon and two other developers of large-scale projects are rapidly planning to get projects underway nearby, after years of empty promises and inaction on the waterfront.